Gorgeous luxury penthouse with stunning jetliner views will take your breath away! Welcome to the modern urban luxury lifestyle at the SkyLofts. Beautiful hardwood floors, designer fixtures, and floor to ceiling windows will satisfy the most discerning buyer. The two bedrooms are private from the main living areas, have stellar views, walk-in closets, and ensuite bathrooms. Both bathrooms have impressive floor to ceiling Carrera marble tile. The open kitchen features all stainless-steel appliances, neutral Italian-inspired cabinetry, and Caesar stone countertops with breakfast bar. The dining area is set off to the side and could potentially be utilized as an office space or third sleeping area. The laundry is in-unit and set in its own walk-in utility room. This space comes with two conveniently located parking spaces near the elevators. Community amenities include 24-hour concierge and security, state-of-the-art fitness center, movie screening room, and a multi-use entertainment room. The location boasts easy access to major freeways and metro. Convenient proximity to LA Live, Grand Central Market, Staples Center, shopping, and seemingly endless dining options. Whole Foods with the Eight Bar directly across the street. 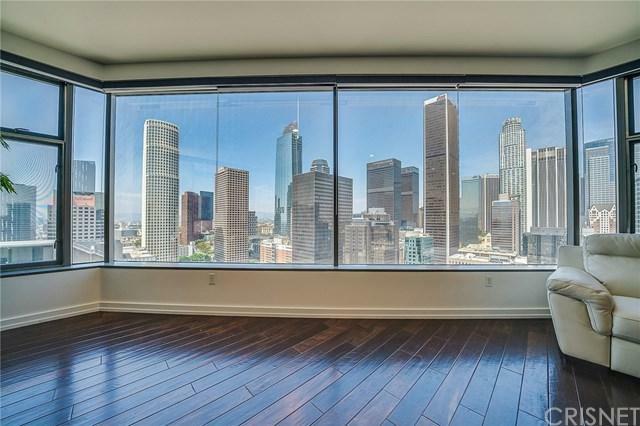 An excellent opportunity for luxury modern penthouse living in Southpark DTLA. Sold by Victoria Szuch of Gold Coast Investments.